The NFL in Dublin: it’s the tease that just won’t end. For years Dan Rooney, chairman of the Pittsburgh Steelers and a former US Ambassador to Ireland, has been talking up the prospect of his beloved football club playing a regular season game in the Irish capital and the project got another airing yesterday when the 81-year old returned to these shores. 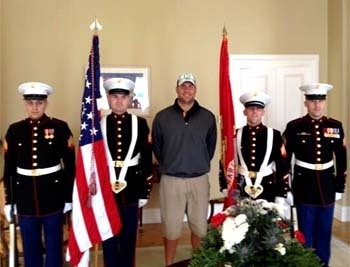 Accompanying him for the Fourth of July celebrations at his former residence in the Phoenix Park was Ben Roethlisberger, the Steelers’ quarterback and one of the most recognisable faces in gridiron this past decade. Naturally, he too was dragged into the debate. Rooney’s role in the success of one of the US’s most successful sporting franchises was barely touched on during his official three-year stint on these shores, between 2009 and 2012, but the 6’ 5” superstar spoke volumes for the dynasty first established by his father, Art Rooney Snr. You can also listen to the podcast of Ben’s interview with “Game On” reporter Diarmuid Byrne here! And you can see all the photos from Big Ben’s UK Tour here!